Russia's brand-new Soyuz-2-1v rocket made a successful debut on December 28, 2013, lifting off from Pad 4 at Site 43 in Plesetsk Cosmodrome at 16:30 Moscow Time (7:30 a.m. EST). The Soyuz-2-1v rocket is powered by a legendary NK-33 engine originally developed during the 1970s for the giant Soviet Moon rocket, the N1. Although Soyuz-2-1v will carry lighter payloads than those launched on existing rockets in the Soyuz family, the new vehicle paves the way to the development of much more powerful launchers, such as Soyuz-2-3, Soyuz-3 and Soyuz-2-3v. The first Soyuz-2-1v lifts off on Dec. 28, 2013. During its first test launch, the Soyuz-2-1v rocket with the Volga third stage carried an experimental version of the 50-kilogram Aist satellite and a pair of SKRL-756 radar-calibration spheres for the Ministry of Defense. All three payloads were released from a special adapter mounted on the Volga upper stage after it had entered a near-polar orbit. The launch had to be postponed from December 23 and December 24, as final tests revealed last-minute technical problems, official Russian media said. The second and final phase of integrated tests, known as KI2 conducted within 24 hours before launch, included loading of the rocket with liquid oxygen oxidizer and its subsequent drainage. The fueling with both oxidizer and kerosene fuel would be conducted just few hours before launch. In the remaining 24 hours before the launch attempt on December 25, glitches in ground equipment required to postpone the liftoff from 16:30 to 18:00 Moscow Time. According to a posting on the web forum of the Novosti Kosmonavtiki magazine, during the first fueling liquid oxygen loaded onboard the rocket was not cooled sufficiently due to problems with the operational documentation. As a result, the oxidizer had been drained and the new fueling had to be conducted. The State Commission overseeing the launch was scheduled to convene at 14:00 Moscow Time on December 25 to give green light to the fueling and the liftoff of the vehicle. Industry sources did confirm that the fueling of the rocket had started. 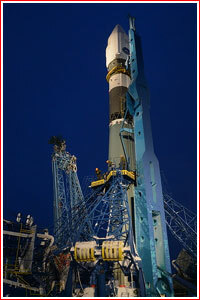 However, around 10 minutes before a scheduled liftoff at 18:00 Moscow Time, the launch was scrubbed. As it transpired later, one of the valves in the pneumatic and hydraulic system of the first stage operated slower than it was programmed to do by the automated launch sequence. Ground crews then proceeded with another drainage of the oxidizer from the rocket. According to a spokesman of Russian air and space defense forces quoted by the official Russian media, the mission had been postponed until 2014, however multiple posters on the online forum of the Novosti Kosmonavtiki magazine reported that efforts had been continuing to fix the ground hardware that had caused the delay and make another launch attempt before the end of the year. Engineers found and fixed the problem with the ground system that had controlled the offending valve, while the launch site officials scrambled to organize a supply of additional cryogenic propellant to replenish available cashe lost to evaporation. The State Commission overseeing the launch apparently convened in Plesetsk around 16:00 Moscow Time on December 26 and set the new launch attempt for December 28, 2013, at 16:30 Moscow Time. A backup launch opportunity was reserved on the same day at 18:00 Moscow Time. 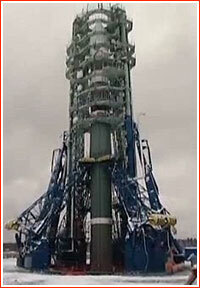 By December 27, the launch was set for 14:00 Moscow Time on December 28. Roskosmos officially confirmed a scheduled launch attempt, following a meeting of the State Commission, which made a decision to proceed with the fueling of the launch vehicle, the agency announced at 11:19 Moscow Time on December 28. 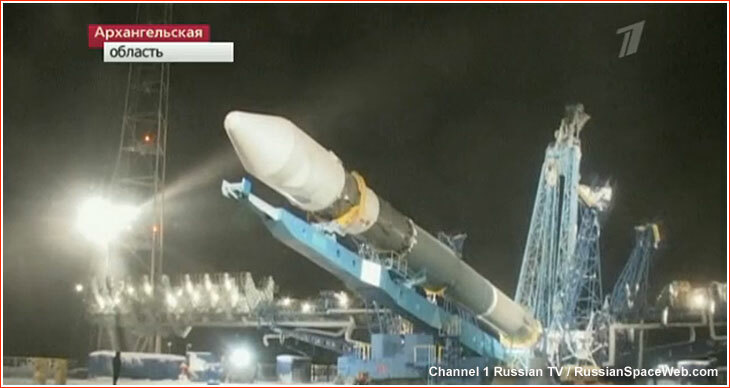 However on December 28, the launch was scrubbed yet again, apparently just minutes before a scheduled liftoff at 14:00 Moscow Time. Unofficial sources said that the same problem with a slow valve had resurfaced, apparently caused by operations under very cold conditions. Again, engineers urgently worked to reprogram the launch sequence. 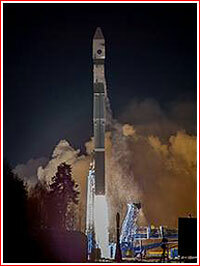 A semi-official Interfax news agency then reported that the State Commission had been scheduled to convene within an hour to consider whether to proceed with another launch attempt on the same day at 18:00 Moscow Time, however few minutes later, the same agency quoted a representative of the Russian air and space defense forces as saying that the mission had to be postponed until 2014. His statement was proved wrong once again, as the officials in Plesetsk were reported pressing for launch on December 28 at 16:30 Moscow Time. According to operational guidelines, the rocket could go through no more than three cycles of fueling and defueling before a required refurbishment at its manufacturer plant. Since the vehicle had already been loaded with propellant three times, it would have to be removed from the launch pad and returned to the city of Samara for repairs had this latest launch attempt failed. Above: The rollout of the first Soyuz-2-1v rocket to the launch pad in Plesetsk around Dec. 17, 2013. This time, the launch vehicle blasted off as planned and quickly disappeared into the fog and low clouds above the launch pad. The first (core) stage of the rocket was expected to fire for 196 seconds. According to the Interfax news agency, the first stage, along with the payload fairing, was expected to fall into the Barents Sea, while the second stage was to enter orbit. The separation of the Aist satellite from the Volga third stage was scheduled 1.5 hours after launch. After the release of its payload, the Volga upper stage was programmed to deorbit over the Pacific Ocean, where Russian authorities requested a zone closed to navigation. Ironically, there was no technical capability for a controlled deorbiting of a larger second stage. Therefore, it was expected to reenter the Earth atmosphere, as a result of natural decay caused by a friction with rarified air. Around one hour after the launch, the Russian Ministry of Defense declared the launch of the first Soyuz-2-1v rocket a success, while posting an image of the wrong rocket along with the announcement. According to the Ministry of Defense, the Volga upper stage separated from the second stage of the launch vehicle at 16:37 Moscow Time. The Major General Aleksandr Golovko, the Commander of the Russian air and space defense forces, VKO, conducted a general command of the launch, the Ministry of Defense announcement said. As expected, shortly after 18:00 Moscow Time, a poster on the online forum of the Novosti Kosmonavtiki magazine reported a successful separation of the Aist satellite from the Volga upper stage. 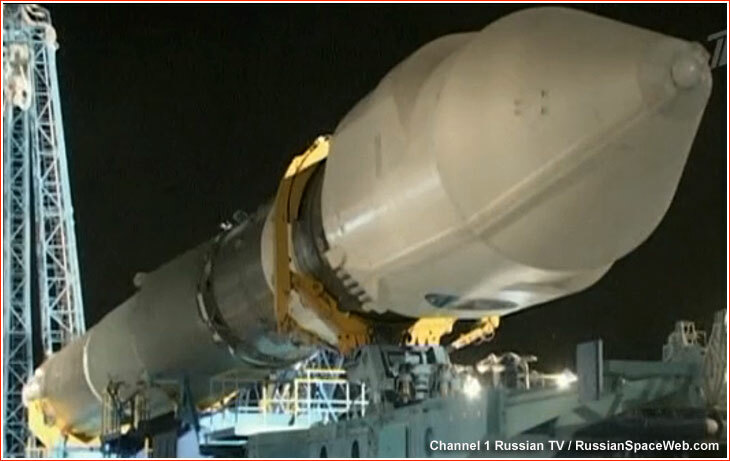 At 18:18 Moscow Time, Roskosmos announced that payloads separated from the Volga upper stage at 18:10 Moscow Time. Western radar detected an object from the Soyuz-2-1v launch (probably a second stage) in a 259 by 595-kilometer orbit with an inclination 82.434 degrees toward the Equator. Another object was then found in a 610.3 by 638.9-kilometer orbit, essentially confirming that the Volga upper stage successfully fired in apogee of the initial elliptical orbit and thus inserted its payload into a final circular orbit. Three more fragments from the mission were circling the Earth in a similar orbit, likely confirming that the Aist satellite and both radar-calibration spheres had successfully separated from the Volga upper stage. Alternatively, objects could represent Aist, two spheres and an adapter, while the Volga had already deorbited by the time these observations were made. At the beginning of 2012, the first launch of the Soyuz-2-1v rocket was promised in the second quarter of that year (540), however by mid-April, the mission was re-scheduled for September. By that time, the primary payload of the launch -- the Aist satellite -- was complemented with a cluster of spheres, which were apparently intended for calibration of ground radars. In the meantime, the rocket intended for the first launch was coming off production line. Following series of checks at TsSKB Progress' Test and Checkout Facility, KIS, in Samara, it was to be ready for shipment to Plesetsk launch site by the end of April. Around a month later, it would be followed by the Volga upper stage, which was also in final stages of production by April 2012. At the time, the launch complex was promised to be ready for the mission by June 15. Preparations of the rocket were plagued by problems with the steering mechanism of the propulsion system on the first stage. It had to be removed from the rocket, returned to the manufacturer for repairs and re-tested for the second time. According to the plans by the end of July 2012, the new rocket would be shipped to the northern cosmodrome in the second week of August and rolled out to the launch pad No. 4 of the 17P32-4 launch complex at Site 43 on August 23 for testing, including loading of liquid oxygen and gases onboard the vehicle. On August 9, 2012, the official Russian media did confirm that all components for the Soyuz-2-1v's first mission, including the Volga upper stage, an adapter and a payload, had arrived to Plesetsk. At the time, a test rollout of the rocket to the pad was planned for August 25, followed by the first launch in the fourth quarter of 2012. However by August 29, the rollout was planned for September 4. By that time, only "dry" tests on the pad were expected without loading of propellant onboard. As expected, the rollout of the vehicle started at 07:00 Moscow Time on September 4. According to an official statement of the Russian space agency, the rocket was installed into vertical position for a four-day rehearsal of all pre-launch operations but fueling. Speaking at the expanded meeting of the company' management on November 16, 2012, the head of TsSKB Progress Aleksandr Kirilin said that the first launch of the Soyuz-2-1v had been scheduled for April 2013. However by March of that year the mission was delayed until the second half of the year. At the beginning of April 2013, TsSKB Progress announced that the firing test of the first stage would take place before the end of the month, with the actual launch planned at the end of summer 2013. After additional technical problems, the critical firing test of the first stage was finally scheduled for May 30, 2013. No official statements on the results of the test had appeared, however unconfirmed reports on the web said that the firing on May 31 had again been interrupted by an emergency cutoff command 50 seconds before the nominal completion of the engine burn, possibly due to a temperature readings from one of the sensors. A test facility in Peresvet remained intact, however the status of the rocket stage, which suffered a serious damage during the first firing attempt previous August, was still unclear as of June 3, 2013. On June 4, OAO Kuznetsov announced that the first stage of the Soyuz rocket successfully went through a firing test. According to the company's statement disseminated by the official Russian media, the NK-33A engine "functioned according to a nominal sequence and the operational logic of all systems of the rocket stage, confirming its high reliability." The statement provided no information on the duration of the test or other details. A poster on the Novosti Kosmonavtiki web forum explained that the test has been qualified as a success despite the stage fired for 150 out of planned 202 seconds. The firing was cut short after a leak had been detected in one of the propellant supply lines leading to the RD-0110R steering engine. The main NK-33A engine functioned as planned. The culprit was found to be related to the non-standard interfaces in the propellant line of the experimental unit. In particular, they were fastened, rather than welded together. Since such interfaces would not be used on the actual rocket, the test was certified as successful. Later that month, the head of TsSKB Progress Aleksandr Kirilin told journalists at the Paris Air and Space Show in Le Bourget that Soyuz-2-1v had been scheduled to fly two missions in September and October. On December 18, 2013, TsSKB Progress design bureau, which developed the rocket, announced that the meeting of the State Commission a day earlier made a decision to roll out the launch vehicle to the launch pad for the second phase of integrated testing. The official statement did not mention the launch date which was rumored to be December 23. Industry sources reported on the Novosti Kosmonavtiki web forum that autonomous tests had started on December 18 and continued during the next day. They had to be followed by integrated and general tests before a green light could be given to the liftoff. Technical problems uncovered during these trials reportedly delayed the launch until December 25. Despite the introduction of the Soyuz-2-1v rocket represented a significant breakthrough for the Russian space program, official Russian sources had provided very little information on the upcoming launch. Instead, an anonymous source in Russia relayed latest information to a French space historian Nicolas Pillet, who then disseminated it via a number of popular web forums. In parallel with preparations for the first launch of Soyuz-2-1v, TsSKB Progress promised to select a payload for the second test launch of the Soyuz-2-1v rocket, which was then planned for 2013. By May 2012, the company disclosed that the Mikhailo Lomonosov satellite (a.k.a. TUS) would be launched in the second mission of Soyuz-2-1v. As of November 2012, the delivery of the Mikhailo Lomonosov satellite to the launch site was promised in September 2013. As of October 2012, the shipment of the Soyuz-2-1v rocket, its Volga upper stage and an adapter to Plesetsk was scheduled no later than November 2013. Some of the parts from the second vehicle were cannibalized for the repairs of the EU-763 test article damaged in a botched firing test in August. 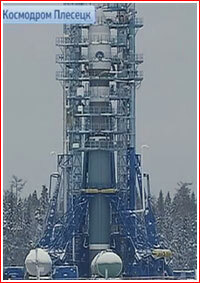 As of October 2012, the second vehicle and its upper stage were scheduled to be ready for launch in September 2013. By June 2013, the mission was expected in the fourth quarter of 2013, or as early as October. By that time, the rocket and its upper stage were still waiting for the delivery of several components during June and July at their prime manufacturing plant in Samara in order to meet the deadline for the shipment to Plesetsk in September of 2013. However around the same time, it was also reported that the primary payload for the mission -- the Mikhailo Lomonosov (TUS) satellite -- could have been delivered late, requiring an alternative cargo for the launch. Also, in the middle of 2012, the head of the Russian space agency Vladimir Popovkin named a British satellite manufacturer SSTL and South Korea among commercial users of the launch vehicle. In October 2012, the Director General of the Gonets communications network Dmitry Bakanov told RIA Novosti news agency that new-generation Gonets-M1 satellites would be adapted for launch on the Soyuz-2-1v rocket, instead of Rockot. The same month, a federal contract for the Obzor-O remote-sensing satellite indicated the first satellite in the series would be launched on Soyuz-2-1v in 2015.